When there is no end of choice in Liverpool, why opt for the local Italian restaurant, Villa Romana? Well, there are many reasons that have seen us build up lots of loyal custom over the past few decades. 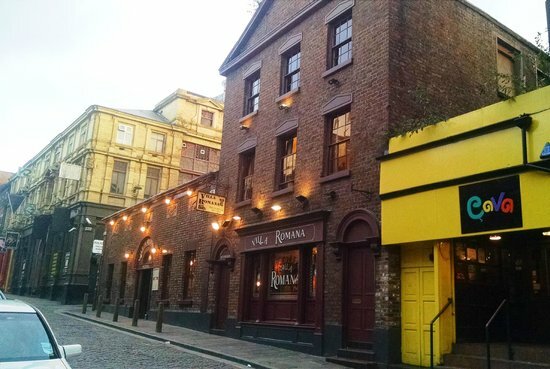 It’s nice to try somewhere new from time to time but everyone has their favourite eateries and, for lots of people in Liverpool, the old favourite is the traditional Italian dinner menu on offer at Villa Romana. If you’re in the market for a new favourite come and give us a try. Italian food is comfort food and hearty fuel. The old staples that can be found on every Italian dinner menu, such as pizza, lasagne and spaghetti bolognese are classics that everybody craves from time to time. When those cravings kick in, what people really want is to find somewhere that makes these traditional favourites really, really well. There’s nothing more disappointing than a lack lustre lasagne. Be assured that Villa Romana is famed for its classic favourites. We have been Liverpool’s favourite local Italian restaurant for years now because we focus on quality. We source the best quality fresh, local ingredients and our chefs work their magic to create an authentic taste of the Mediterranean. If it’s a classic Italian dinner menu you want, you will not be disappointed and you probably WILL want to follow it with a selection from our equally famous, indulgent dessert trolley. We all want the classics from time to time but it’s also important not to get stuck in a food rut. You don’t have to stray from Villa Romana in order to surprise your taste buds. We have a wide, varied menu that includes everything from steak to seafood and pasta to, well, antipasti, all prepared in traditional Italian style and changing seasonally. You can stick with the quality and service levels that you trust and still try something new at our conveniently located local Italian restaurant in Liverpool city centre. If you’re wondering about the best time to visit Villa Romana for the first time, why not take advantage of one of our current offers? You can get 50% off any pizza and pasta dish at your favourite local Italian restaurant every Wednesday evening from 5:30pm. So, whether you haven’t visited us for a while or you’re new to the area and on the lookout for a local Italian restaurant, come and discover what has made us a firm favourite.